The work of Coe and Prevot in the Steens Mtns of southern Oregon appears to indicate that rapid magnetic reversals in superpositioned strata must have occurred rapidly, in up to 15 days due to known cooling factors in lava and the "freezing" of the magnetic polarity. About 50 such reversals are known in the geologic column model. I'm not quite ready to buy Gary's sudden discharge affecting 10-millions of square kilometers of ocean basin (though I would love to discover it was true!)... it would require I abandon a fairly stable paradigm in my model of rapid seafloor spreading. I read a Farley Mowat book, Lost in the Barrens, in which the main characters describe their ordeal, and they mention the old pebble beaches that run for long distances, and were/are supposedly the result of the rocks being tumbled along the ancient sea shore. 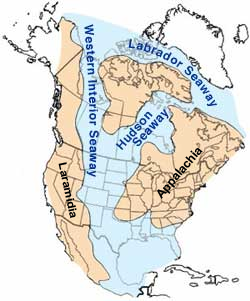 I'm fairly sure my research shows that pebbles are the result of electrical processes associated with discharge events, so the ancient seaway, which connects regions where there appear to have been even greater activity, Hudsons Bay, the Gulf of Mexico, and Prudhoe bay. From the previous image of the N.Pole excavations, it appears, to me, that a plasma flow could have been the cause. Also in the book, the Eskers are mentioned, but the standard geological model for their formation does not make mechanical sense either, to me. The Great Lakes are plasma excavations, the St.Lawrence a discharge track, The Mississippi too. Yes, a lot of imagination required, but the standard models also are pure imagination, IMO. Well, I think an alternative model of stars that will obsolete the old one is close at hand. Not just stars, but many energetic phenomena at all scales, as they all follow the same basic progression. The flux tube, the pinch, vacuum spark/arc, gamma ray emission, symetry breaking, gamma-gamma physics, pair production, optical rectification. Also involved are the fields of the dipole and the creation of torii and spheres, and particle acceleration. I'll start with the flux tube. The recent Hyder flare on the Sun and the large CME associated with it hint that a pinch/vacuum arc event is occuring, and as the filament can be quite long, this allows for much more energy to be 'drained' from the filament, resulting in the long duratiuon noted with the Hyder flares. CMEs then seem likely to be matter creation events rather than ejection events of existing solar material, as they will also create gamma radiation and allow for gamma-gamma matter creation. Getting ahead of myself here, and I want to introduce the proposed mechanisms gradually, in order that anyone who sees a glaring hole can explain my errors and save me digging a big hole that goes nowhere! CMEs then seem likely to be matter creation events rather than ejection events of existing solar material, as they will also create gamma radiation and allow for gamma-gamma matter creation. Is this suggesting that vacuum energy is able to produce real particles from virtual particles?...with a little help from "staggering amounts of energy"? Well you'd have to ask the QED folk about how how much energy is in the vacuum, but basically, even after their renormalisation process, the vacuum is still calculated to contain, within the volume of a single proton, sufficient energy to create all the matter in the known universe. So if during a solar flare, there is a method of tapping the vacuum energies, then the creation of even billions of tons of matter is peanuts compared to what is on tap. If the Sun, at its initiation, were to also tap the vacuum, then the creation of all the matter within the Solar system is still peanuts. I'm not going to invent any new science here, most of what I will post has been suggested by astrophysicists or plasma scientists or high energy experiments, all I am trying to show is that there is an alternative model of stars, and all the way up to magnetars, but the mainstream chooses to ignore it. I will also offer alternate explanations for some of what we are told about certain observations by astronomers, most of which are unprovable, but my interpretation can also not be dis-proven. Well, maybe someone will trash one or two ideas, we'll see. Just as an example of how lab experiments could also suggest astronomical processes, this link is to a 1970 paper on the generation of Alfven waves in a nitrogen plasma column, by the action of a theta pinch. Plasma shocks are an important process in astrophysics. Construction of a Theta-Pinch for the generation of shock waves in a nitrogen plasma. Also in the scientific news lately is the wakefield acceleration process, as it will allow for table-top sized accelerators, but this same process is likely functioning at the larger scales, and applies to acceleration in a torus too. Observations at scales up to the intergalactic would seem to show that pinches occur where there is a tight curve in a flux tube. If symetry breaking is to be considered in the possible mechanisms for releasing the vacuum energies. Gyrokinetics and the toroidal momentum pinch seem to provide a possible mechanism. A bit of "empty space" the size of a sugar cube contains enough "seething electromagnetic energy" to power all the electrical loads on earth for millions of years. Obviously, if we can extract just a tiny fraction of this energy in electromagnetic form we can use it to power our loads for free — or nearly so. We need only power the "gating" or "switching" of the flowing energy, and thus cause a great deal of work to be performed, even though we ourselves input little or no energy. So the pinch, perhaps the gyrokinetic model, may be the 'gating' mechanism for this release? My understand is that particles sit in this vacuum foam and draw energy from it. Why a perturbation of that field would allow energy to flow toward the observed, I do not understand. But, excess energy is measured with several machines, and Tom Bearden claims it to come from vacuum field. I also do not understand this broken symmetry thing, nor the extraction of energy from "time". I have searched for the MEG energy machine for sale, but have not found anything. Hey Sparky. I suppose what I am looking for is the possible sources of gamma rays, or perhaps energies above gamma rays? exa-rays have been detected, yota rays are theorised I think. So if there is a mechanicm where a sustained source of gamma rays is produced, then large amounts of matter could be created. What are the sources of gamma ray production? ...The researchers also observed very little rotation in AzTEC-3's dust and gas—suggesting that something had disrupted its motion. Taken together, these two characteristics are strong indications that AzTEC-3 recently merged with another galaxy. "AzTEC-3 is currently undergoing an extreme, but short-lived event," said Riechers. "This is perhaps the most violent phase in its evolution, leading to a star formation activity level that is very rare at its cosmic epoch." New electron spin secrets revealed: Discovery of a novel link between magnetism and electricity. Researchers from the Norwegian University of Science and Technology (NTNU) and the University of Cambridge in the UK have demonstrated that it is possible to directly generate an electric current in a magnetic material by rotating its magnetization. Another question is the source of the silicon and silica that is so common in space. I believe the silica is formed in the 'creation disks', what they call accretion disks. A new development will allow for the detection of highly-reactive silicon compounds in space, maybe they could help locate the source of the silicon itself? All eyes on Philae tomorrow I imagine, hope they can determine its composition, and if they do, that they will let us know sooner rather than later, or never. The comet has spoken. It's a rock!! I give them credit for putting their necks on the chopping block though. And for a really sad, to me, indication of the state of these 'scientists', listen, if you can stomache it, to this panel discussion. Live from DragonCon 2014! Fraser and Pamela are joined by Les Johnson, Scott Edgington, Erin MacDonald, Roy Kilgard, and Fraser bombards all of these wonderful scientists with the hardest, most complicated questions he can come up with! And these are the clowns filling the youing, impressionable minds, our future scientists, with absolute trash. Sad indeed. The vacuum spark already is part of the model of some astronomical objects, though of course they are still using a model that has gravity and ultra-dense matter as the primary cause. They need that dense matter to provide charge separation, but if at the core there is gamma radiation, then the charge separation is by optical rectification instead. It should be emphasized, and this is the main subject-matter of this work, that in the similar terms the pulsar can be thought of as a ”vacuum device”, in which the magnetospheric plasma acts as the walls, limiting the cavity and the waveguides as well the breaks in the magnetosphere, through which the radiation of GPs is transmitted. The radiation itself arises at discharges in the vacuum gap. In my present model of these energetic objects then, it is the tension and torque in the longitudinal magnetic field of the flux tube, eventually reaching the mechanical limits of the flux tube, and the gamma energies are the result of a leakage due to the 'straining' of the vacuum, creating the broken symetry condition. I'm not going to say I have it all figured out as far as the possible configurations or combinations of z, theta or spherical pinching, but it seems that all complex phenomena may have their basis in symetry breaking conditions. And these are the clowns filling the young, impressionable minds, our future scientists, with absolute trash. Sad indeed. 1. Over-ruling "I don't know" from a scientific discussion dismisses science from the discussion. 2. Whatever follows must be understood to be somewhere on the continuum of "imaginary" to "imaginative". 3. I felt the panelists did a good job under this impossible rule of imagining what standard models have to offer in terms of understanding our universe. 4. Imagination often leads to good science, but all statements thereof, whether by SM-ers or EU-ers, must be accompanied by a clear presetting of and frequent allusion to one's peculiar presuppositions. Every scientist works from a particular set of presuppositions, and should present his/her conclusions in the light of those presuppositions. 5. We should not forget that while modern science is governed by a mindset that honors imagination, exalts tentativity, and embraces alternative propositions, all scientists are human, error-prone, and most tend toward insecurity. Hi webolife, had to think a while about that one, but to me it boils down to a systemic problem with the existing education model. From the outset, the system begins to mould the overall collective reality, and it is difficult for individuals to maintain independence of thought. Rocking the boat gets one classed as disruptive or subversive. I know, that's how I was at school! But, after becoming familiar with the works of Buckminster Fuller, and reading that he too, and quite a few others who went on to become prominent in the sciences, business or industry, had also had run-ins with the system, I felt that my dislike of the rigidity of the established learning systems appropriate. Not that I blamed the teachers, some were supportive of my rebelliousness and enjoyed my often confrontative attitude. Even in college I'd frustrate some of the Electrical Engineering instructors because I would not just readily accept everything they said as Gospel truth. To blow my own trumpet a little, one day, during my apprenticeship, I was called into the chief Electrical/Instrument Engineers office and given a talking to about my scholastic performance, and I was pulled from my EE course (1 day, 2 night school sessions per week). I thought I was in for trouble, but after my telling off, I was informed I would be placed as personal assistant to the head of Electrical Engineering Development, one of my duties being to bring the Engineer into the then new field of integrated circuits and solid state control systems. Buckminster Fuller wrote extensively on the education system, and though I don't agree 100% with everything he wrote, I do believe he was correct in his assessment of the existing system. It rewards conformity, memorising 'facts', passing exams, toeing the line if you like. Well, I still don't toe the line, so I think what bugs me about listening to the likes of those shows is the feeling that those young minds are also having their overall thinking and reasoning patterns shaped in such a way as to reduce their potential to become the discoverers and innovators who will help in leading the world towards a fairer, ecologically sound and sustainable future aboard Spaceship Earth. GaryN wrote: Hi webolife, had to think a while about that one, but to me it boils down to a systemic problem with the existing education model. From the outset, the system begins to mould the overall collective reality, and it is difficult for individuals to maintain independence of thought. Rocking the boat gets one classed as disruptive or subversive. I know, that's how I was at school! But, after becoming familiar with the works of Buckminster Fuller, and reading that he too, and quite a few others who went on to become prominent in the sciences, business or industry, had also had run-ins with the system, I felt that my dislike of the rigidity of the established learning systems appropriate. Not that I blamed the teachers, some were supportive of my rebelliousness and enjoyed my often confrontative attitude. Really is sad, our education system. It is basically a social caste system in my opinion. In my experience I have met intelligent people who have never attended college, and idiots who have and of course idiots who didn't attend and intelligent who did attend. College does little in the way of training or education, just a group of people who actually have the time and opportunity to learn and they do, anyone could make it through college if they tried. It is just a way to filter society. I have heard more and more talk about making public schools teach the skills employers want. Whatever happened to employee training on the job? They just want them to know everything and have public schools provide the public training. Our society is on a down hill slide and I just wish there was someway to reverse our course, some way. Yes, and my presupositions are obviosly biased in the EU direction, and are imaginative, but that imagination is supported I belive by what is now being detected by the ever more sensitive instruments, which are showing shapes or structures that can be seen in EM phenomena. The pinches seem abundant, as do torii, and what appear to be the fields of dipole or loop antennas, and dual torii, depending on a number of variables, could possibly explain some of the more peculiar structures now attributed to gravity, or dark matter say. Anyway, a little more EM forces imagination. Here is a model of Earths magnetic field that could explain the observed quadrupolar and octupolar components. They still have a molten core, but with two unbalanced, counter-rotating convection circulations. The Earths measured external magnetic field is the difference between the strength of the two internal fields. I like the concept of the two fields, but not from convection of a molten core. Another method for the measured external field though could be that the internal fields are much stronger, and that there is a shielding in effect from the material of the layers of the Earth. Magnetic shielding y a ferro-magnetic wall would reduce the measured external field by having the magnetic field lines directed through the crustal layers, which would produce ground currents. The external field strength would be dependent on the nature and thickness of the shielding. The Sun may also have a similar mechanism, but the conveyor belt model is not correct IMO. 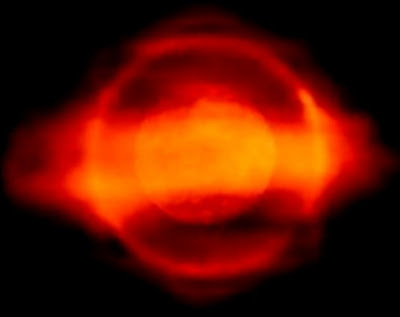 Twin torii with internal particle acceleration is likely producing the hot spots that we see as sun spots, and the Suns measured external magnetic field may be a very small percentage of the internal field strength, but again, as the Sun seems to have an iron layer, the external field may again only be the difference between the strength of the two internal fields. A torus could also be considered a loop antenna, and has similarities to a Hertzian dipole, the difference being that the electric and magnetic fields are "swapped over"
So with the Suns two plasma tori acting as loop antennas, back to back, should we then expect to see two external toroidal fields? My imagination again maybe, but it appears to be a possibility. I'm all for utilising our imaginations, but try to keep them within what I beieve to be reasonable bounds set by experimentally demonstrated methods, whereas the idea expounded by the gravity-centric proponents need things like almost-infinite masses, neutron stars, dark whatever, none of which, IMO, will ever be confirmed.